Now in its 40th year, CoastCon is the Gulf Coast's premier celebration of all things gaming, cosplay, and science fiction. Being held this year from 3 - 5 March, CoastCon is an annual convention, which is held by CoastCon, Inc. CoastCon, Inc. is a nonprofit literary organization dedicated to hosting events that are designed to foster reading, education, and fellowship in the fields of science fiction, fantasy, and gaming throughout the Southern United States. 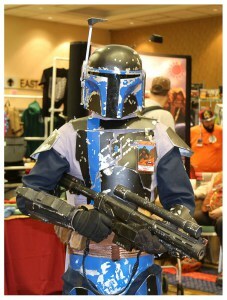 CoastCon, Inc. uses this event each year to support a charity in line with the convention's goals. CoastCon will once again be held at the Mississippi Coast Coliseum and Convention Center in Biloxi, MS, and will include games, vendors, special guests, and an art show. This year will also include a charity auction, costume contest, and Saturday night dance! Guests planning to attend should consider purchasing a ticket for all three days at a discounted rate. In addition, there will also be panels, seminars, and workshops throughout the weekend; these will cover all aspects of gaming, sci-fi, comics, and fantasy, from writing and costuming to the art and science behind some of the most popular series and characters. Fans of Lord of the Rings, Dungeons & Dragons, or Halo should be sure to stop by the convention for a chance to see their favorite characters, enjoy fan-run card and board games or RPGs, or purchase a unique piece of artwork. There will also be many merchants displaying and selling jewelry, clothing, books, tapestries, and weapon recreations. There is something for every kind of fan! This is a popular event so be sure to plan ahead early, and book a room with us at the Margaritaville Resort. We are just a short 15 minute trip away from the convention center.